Sunday 9th June 2019 2.00 to 6.00 pm – Be There!! 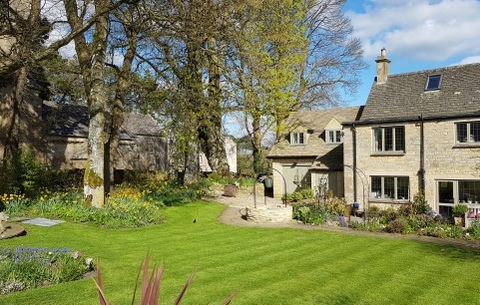 Whatever the weather, our Open Day attracts ever bigger attendances, may of whom are visitors from previous years – a great complement to all the villagers who work so hard to organise all the gardens, stalls, activities and refreshments. 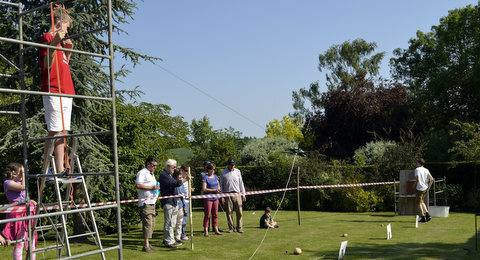 Each year the event raises funds for the upkeep of the local church and Village Hall. This is our 27th annual event, and the descriptions below will give you the ‘flavour’ of how the day runs. If you wonder where Elkstone is, please click here. Straight away it must be said that over the years, thanks to the wonderful support given to us by websites and media (see below) we have had outstanding attendances, and this simply would not happen without their help. 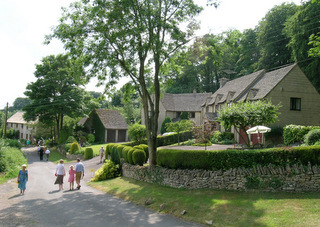 Visitors have a unique opportunity to visit this very special Cotswold village and see it in a detail not normally accessible to the casual visitor. 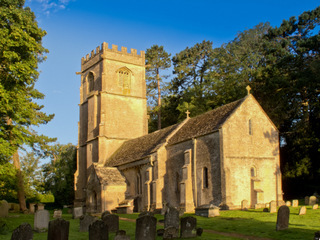 St John’s Elkstone is the highest church in the Cotswolds, and dates from Norman times. The dawn sun shining through the chancel window illuminates the altar area with golden glow of stunning beauty. In the last year much work has gone into eco-themed developments including a “bug-hotel”, the Coronation Meadow, and new eco ‘facilities’ for the benefit of visitors. The church has quite exceptional Norman arches in the chancel and sanctuary, and boasts a wonderful Norman tympanum above the south door. 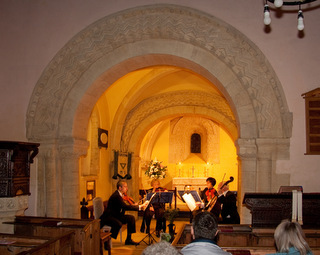 The chancel arches, and those leading to the altar, are among the best in Gloucestershire, if not in Britain. Evil Spirits – Keep out!! 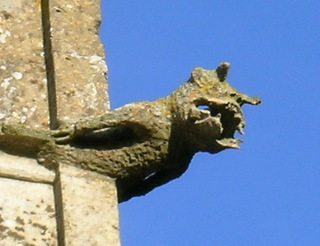 It has been said by those who know that it was well worth taking a detour to explore the church and its striking collection of Norman arches and decorative features including grotesque monsters, birds, and a very Roman-looking centaur, ready to shoot an arrow from his bow. 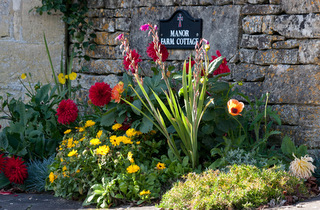 In the course of the afternoon you can amble through a selection of beautiful private gardens. In preparation for Open Gardens Day, villagers prepare a range of garden displays from the very simplest, to those that would challenge most! Some blooms are really special! Even Elkstone villagers enjoy the scenery each year! Visitors can try their hand at hitting the targets with our 633 Squadron Lancaster! 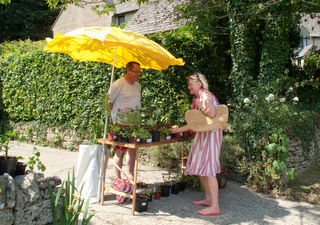 Browse the many stalls which feature lovely jewellery, a tombola, plants and much more; around the village are hand-crafted books telling stories of Elkstone history through the years. Tea, Coffee, and soft drinks too! 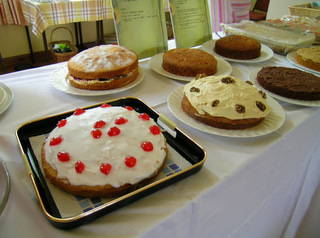 Visitors enjoy village teas, & home-made cakes or ice creams…. 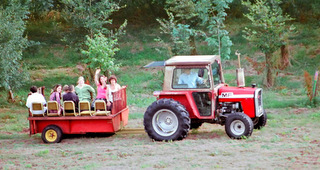 – or enjoy a tractor ride through farmland with sensational views. On this special afternoon you can not only soak up the atmosphere, made more special with glorious flower displays but you can also hear the bells and visit the bell tower. 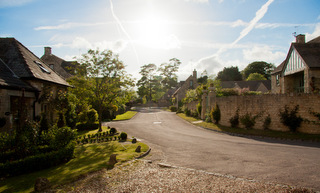 Elkstone’s houses date from medieval through to modern times – they all represent the glorious heritage of the Cotswolds – we hope you’ll enjoy your visit – we’re sure that like hundreds of others, you’ll want to visit us time and time again! 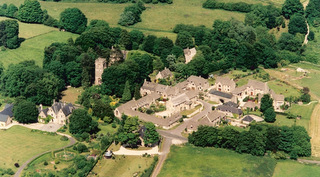 • Cotswolds Info whose website link is Cotswolds Info. • Cotswold Preview whose website link is Cotswold Preview. 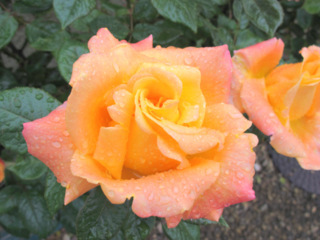 • Country Gardener whose website link is Country Gardener. • Cotswold Life Magazine whose website link is Cotswold Life. • So Glos Online Magazine whose website link is So Glos Online Magazine. 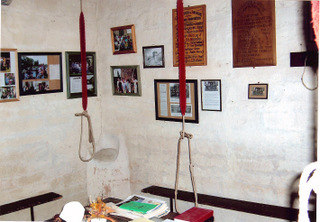 • Gloucestershire Guide whose website link is Gloucestershire Guide. 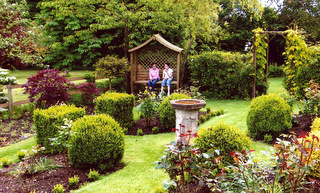 • Open Gardens UK National Directory whose website link is Open Gardens. • Where Can We Go whose website link is Wherecanwego. • BBC Radio Gloucestershire whose website link is BBC Radio Gloucestershire. We have many other organisations helping us to publicise this event – a big thank you to you all! If you have a query about this event, please fill in the form below. Hire Elkstone Village Hall for your Functions in 2 easy steps! Elkstone Village © 2019. All Rights Reserved.